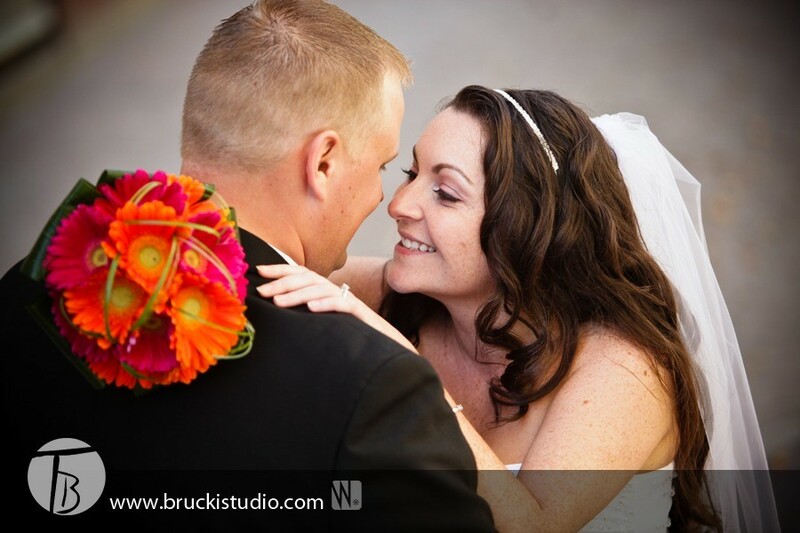 Today we take a look at Rachele & David’s wedding! We worked closely with these two for over 2 years planning for the big day. Thanks to Trevor Brucki for these gorgeous images! We have some of these beauties up in our showroom! Thank you!! Everything was FANTASTIC!!! I can’t tell you how amazing the whole day was! It was exactly how we pictured it!! The décor was AMAZING!! Everything looked so beautiful!! When I was walking down the aisle, everything looked soooooo beautiful for the ceremony!!! The canopy was gorgeous and you could feel the room was full of love. The décor took the ceremony to a whole other level! And Alison came to the rescue when there was a wardrobe malfunction when David’s button popped off! She was right there ready to fix it! Dana met me at the limo and was right there for me if I needed anything at all. When we walked into the reception, it took our breath away!! One word – STUNNING!!! The head table was gorgeous!!! All the linens looked sooooo beautiful, I couldn’t stop looking at everything, there was so much to take in! The details were ENDLESS!! The linens and Julie’s stunning flowers together, all the colors were so vibrant and all the candles, it was so romantic! I loved the candles all around the room and especially the head table décor, the candles and rose petals together were gorgeous. Everything from the orange water to the pintuck linens, from the chair covers to the backdrop, I was speechless. And the ceiling décor, it was perfect, it filled the room with such warmth and it was so romantic, it was amazing! It completed it! The cake and candy buffet took my breath away for a second time! Alison’s vision was sooooo PERFECT!!! Those ceramic stands were gorgeous and the intricate bows that Alison tied on them really were amazing! I can appreciate the time spent tying them!! The details in the ribbons and the gerbera daisies really made it extra special!! I couldn’t stop look at how beautiful the whole candy set up was and I couldn’t wait to dig in!! The flowers, linens, canopy and lighting made the cake look amazing! The lighting! The rose pedals! The candles! The details were endless!! The stationary was so important to me and all of your décor made all of it look so good!! All of Alison’s ideas were fantastic; the framed invite and the children’s coloring books! All the parents thanked us again and again for thinking of their children that way. I asked my mom how she liked the room…. she loved it! She loved the candy buffet!! She said when my dad (who knew nothing, we didn’t tell him anything, we wanted him to be surprised)… she said he almost started crying when he walked into the reception. He was in awe at how beautiful everything looked. He needed a minute to take it all in. All of our guests were so excited! After they saw the ceremony and how beautiful it looked, the anticipation during cocktail hour was killing them! Everyone we talked to couldn’t wait to see the reception room!! We received soooooo many compliments on everything, the flowers, the colors, the linens, they loved it all!!! Everyone had soooo much fun!! The candy buffet was a HUGE HIT!! My relatives from Italy had THE best time and LOVED everything!!! They have never seen anything like this! The evening banquet manager Brian said to us at the end of the night, he too thought the room was stunning. He said it was one of the most beautiful weddings he has ever seen at the Hilton. And Trevor loved all the details, there were so many for him to shoot!! I can’t wait to see his photos!!! Alison and Dana were so awesome!!! They were there for us every step of the way the day before and the day of! David and I knew we didn’t have to stress over anything and that was the best part. Your team knew what we wanted and they delivered more than I could have ever imagined. I am forever in awe of their creativity. They made the entire day so easy for us, I can’t thank them enough. I got so nervous when I had to give a speech, I was trying not to choke up during my thank you to them and even when they came to see us one last time, I choked up again! Please thank them again and again for us!!! And to you Madeline, I can’t thank you enough; actually, I’m tearing up right now. You made our wedding amazing. You were amazing. No matter what hour of the day it was, you were there for us. I said it in my thank you speech and I’ll say it again, from the moment we met you, I knew we had an instant connection. You knew how important all the little details were, especially to me and I can’t thank you enough for your constant support. I know I’ve made a friend for life and I can’t begin to thank you for everything you’ve done. You and your team and everything you and them did for us, not only during the whole day, but this whole experience, was the best part about the wedding. 2 years flew by with no stress, no worries, and it was all cause of you and your team. Simply amazing! The whole day was so perfect and so beautiful! We had the wedding of our dreams, I’m sad that it’s over but it was truly an amazing day! We can’t thank Madeline’s Weddings enough!! To see more from their amazing day check out their gallery on our site HERE! To see more reviews on Madeline’s Weddings & Events go to our site HERE!